"This is my Doubull-Mastiff pup named Coda. He is a singleton. He is fawn with the most gorgeous coat ever. The dam is a brindle Bullmastiff and the sire is a brindle Mastiff. He was 15 lbs. at 6 weeks, and 50 lbs. at 12 weeks. He is the most calm and gentle giant. Very alert and has a mature look about him." The Doubull-Mastiff is not a purebred dog. It is a cross between the Bullmastiff and the English Mastiff. The best way to determine the temperament of a mixed breed is to look up all breeds in the cross and know you can get any combination of any of the characteristics found in any of the breeds in the hybrid. Not all of these designer hybrid dogs being bred are 50% purebred to 50% purebred. It is very common for breeders to breed multi-generation crosses. 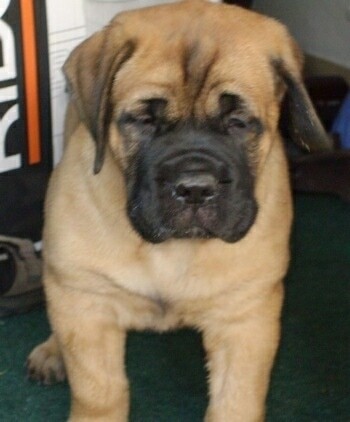 "This is Coda, my Doubull-Mastiff puppy at 12 and a half weeks old. He is a singleton pup."